Walter Galpin Alcock was born the son of Walter William Alcock, at Edenbridge, Kent on 29 December 1861. His father became the Superintendent of the Metropolitan and City Police Orphanage which opened at Fortescue House in the London Road, Twickenham in 1870. In 1874 the Orphanage moved to Wellesley House, in the Hampton Road, and Walter moved with the family. Walter became a chorister at Holy Trinity Church, on Twickenham Green. 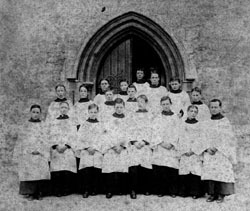 He also became interested in playing the organ at St Mary's Church in Twickenham where he took lessons from the organist, E H Sugg, and later joined the choir. He graduated to playing the organ at Evensong in return for his lessons. However, on the first occasion that he was to perform the organ blower did not appear and he had to sit at the silent instrument for the duration of the service. He also played the organ at Holy Trinity but was soon barred for over use of the reeds. 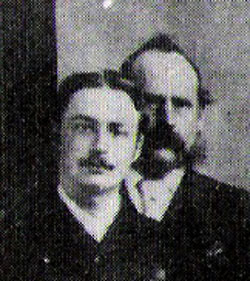 In 1874 Walter began to study at the National Training School for Music, at the Royal College of Music, under Sir Arthur Sullivan and John Stainer. At Twickenham it was no doubt a happy coincidence that the Vicar, the Revd H F Limpus was himself of a musical family, the son of Richard Limpus the blind organist of Isleworth Parish Church. Another Limpus, also Richard, had founded the Royal College of Organists in 1864. In 1880 he was appointed organist at St Mary's, following the retirement of Sugg. Next, in 1887 he became organist at the Quebec Chapel, St Marylebone; then, in 1896 assistant organist to Sir Frederick Bridge at Westminster Abbey; later, organist at the Chapel Royal and, in 1916, organist at Salisbury Cathedral, a post he held until his death in 1947 at his house at 5 The Close. Here he constructed a model railway, with a steam engine and tender, the “Patrick Stirling” on which choristers from the cathedral would take rides. There is a memorial to him in the Cathedral. He played the organ at Westminster Abbey at the coronation of three monarchs: Edward VII, George V and George VI. In 1893 he was appointed Organ Professor at the Royal College of Music. He was knighted in 1933.